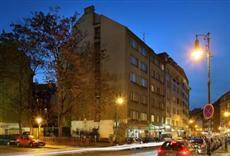 This Prague accommodation is located in the historic district of the city. Guests will be able to walk to many of the popular attractions in the area, including the Old Town area and the Jewish Quarter. Guests will find that some of the most popular sites in the city are easy to reach with just a short walk. Visiting other areas is easy with the aid of a rental vehicle or public transportation. The airport is only a short drive away, and the hotel can offer transfer service. Guests will find nonsmoking rooms at the Residence Bene Prague. Some of the amenities in the rooms include hairdryers, in room safes, showers, and satellite/cable TV. The rooms also have bathrooms. Those who stay at the hotel will be able to enjoy a breakfast in the breakfast room each morning. The Bene Prague offers an onsite restaurant that serves a wide variety of dishes. The hotel has safety deposit boxes, airport transfer, and laundry and dry cleaning service as well.